My reference in a column today, "'Rushdie Rules' Reach Florida," included this sentence: "A 2003 decree ruled the Bible suitable for use by Muslims when cleaning after defecation." That allusion deserves further explanation. Dena Milany's Facebook entry attacked the Koran and led to a fatwa against her. Interestingly, Fatwa #40378 is no longer posted at the Encyclopedia of Fatwas; an announcement on its old page drably states that "There is no fatwa with this number." The screen shot posted on my website, however, establishes that this fatwa was once posted. Fatwa #40378 appears to have been removed in late 2009, as a result of the Dena Milany controversy. 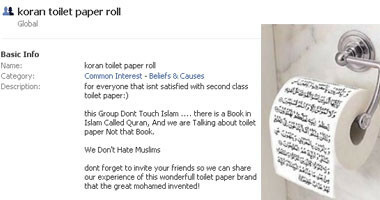 Milany, a German woman, posted the fatwa in English translation and Arabic original, then posted a call on Facebook for a "koran toilet paper roll," complete with graphic of such an item. Muslims demanded the deletion of this page and the agitation reached to Egypt, where Sheikh Ali Abu'l-Hasan, a former president of Al-Azhar University's Fatwa Committee, published a fatwa (reported in the Egyptian newspaper Al-Yawm as-Sabi' on September 27, 2009) in which he ordered the "shedding of [her] blood." Milany responded by publicizing the above fatwa on her blog, http://denamilany.blogspot.com.